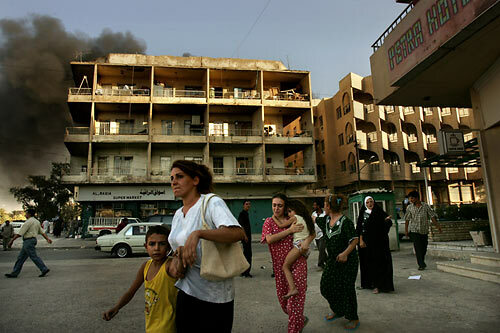 "SOFT TARGETS" After nearly two years of war, Iraq is a country consumed with fear and uncertainty. While the battle rages for control of the country, no one is safe from the daily barrage of bombings and military operations. Tens of thousands of Iraqi's have died in a war waged on their homeland. American soldiers hunt for an enemy they never expected, falling victim far too often. There is no place to hide from the violence that permeates Iraqi. There are few who remain untouched. SOFT TARGETS - A trail of women and children flee their neighborhood where multiple car bombs exploded targeting Christian churches and their communities in Baghdad. Dozens were killed in the synchronized attack.